In a quiet corner of Venice ,the Venetian palace (palazzo) believed to be explorer Marco Polo’s former residence is easy to miss. Stop by Corte Seconda del Milion, a square named for Marco Polo's travel memoirs, Il Milione, to honor Italy's most famous adventurer while visiting the Floating City. Marco Polo's House (Casa di Marco Polo), near San Giovanni Crisostomo Church and behind Teatro Malibran, isn’t open to the public, but there’s a small marble plaque on the wall commemorating its importance. The house, which faces a small triangular patch of sidewalk next to a canal in the Corte Seconda del Milion, can be quite difficult to find. Walk through a passageway (sottoportego) that cuts through what would be a building’s ground floor to reach it. Marco Polo's House is best visited as part of a Venice walking tour or guided tour of nearby highlights, including Piazza San Marco and St. Mark's Basilica, Doge's Palace, and the Rialto Bridge. The building is set on one of Venice's quiet internal canals not far from the Grand Canal, so it can also be seen during a gondola ride through the city. Being near to the Rialto market, it’s an easy stop on Venice street food tours that include a walk through the market stalls and surrounding neighborhood. If exploring Venice on a walking tour, wear comfortable shoes, a hat, and sunscreen. The sidewalk facing the palace is accessible to wheelchairs, if approaching from the Cannaregio side; from the Castello side, there is a small bridge with stairs to cross the canal. Though you can’t tour inside the palace, its facade and surrounding neighborhood are particularly picturesque, so be sure to bring your camera. This is a memorable stop for history buffs. Marco Polo's House is located on Calle Scaleta, on the border between the Castello and Cannaregio neighborhoods. Reach the building on foot from St. Mark's Square or the Rialto Bridge, or by water taxi from the Grand Canal. 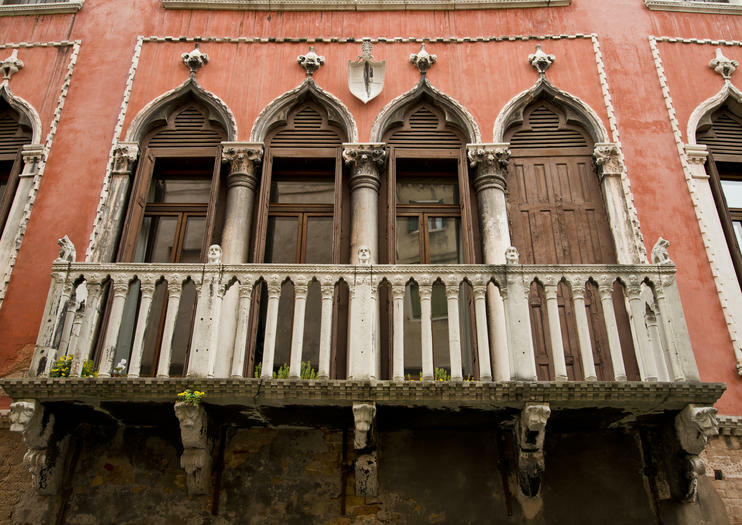 Marco Polo’ house is one of Venice's quieter sights, located in a sleepy quarter of the city center. If you need a respite from the crowds during busy midday hours, this is a good spot to choose. Experience the best of Venice on a day trip from Florence that provides the ideal mix of free time to explore and guided expertise. Ride the high-speed train to maximize your time in the ‘Floating City,’ including a private water taxi ride through romantic canals and a walking tour around St. Mark’s Square. Save even more time with skip-the-line entry to St. Mark’s Basilica and special access to the dazzling cathedral's terraces for panoramic views. Enjoy a real taste of Venice with a tantalizing lunchtime tour of the Rialto market and discover the city’s impressive culinary credentials. Follow your guide on a 4-hour tour of Venice’s foodie hotspots, browse the fresh produce at the city’s famous markets and tuck into traditional cicchetti (Venetian tapas) at a local inn. Finally, sample fine regional wines and prosecco at the city’s legendary Bacari bars, then leave armed with plenty of recommendations for where to shop and dine in the city. Explore the hidden corners of Venice on a 2.5-hour walking tour and benefit from local knowledge. You'll stroll with a small group to the city square of Campo Santa Margherita, see the Scuola Grande di San Rocco, and visit the Basilica di Santa Maria Gloriosa dei Frari. Then cross the Rialto Bridge and walk past the Marco Polo House to St. Marc's Square. Upgrade for a private tour. Saint Marks Basilica and the Doges Palace are two landmarks rarely left off any Venice Itinerary, but their popularity means that visitors often spend more time queuing outside than exploring inside. Visit both on this 4-hour tour, including skip-the-line entrance and a walking tour of romantic Venice. Venice is full of historic landmarks and romantic views but it can be a challenge to get younger children excited about sightseeing. This private tour is specially designed for families, so you can visit sights such as Campo San Bartolomeo, the Marco Polo house, and the Rialto Bridge, and keep the kids amused with entertaining commentary and fun activities. Experience quintessential Venice on this 3-hour walking tour, including a memorable gondola ride. See iconic landmarks like the Rialto Bridge and the House of Marco Polo; get a taste of local life at the Rialto Fish Market and explore historic neighborhoods like Cannaregio. Then, admire the palatial architecture of St. Mark’s Square, enter the magnificent St Mark’s Basilica and soak up the scenery on a romantic gondola cruise. This small-group tour is limited to 12 people for a personalized experience. Get exclusive, skip-the-line access to the very best of Venice on a private, 6-hour walking and gondola tour of the city. Learn about Venetian art and culture as you trace a route from Piazza San Marco to the elaborate Doge’s Palace and the Bridge of Sighs. Discover the remarkable architecture and history of the Basilica San Marco, and continue through a series of churches, landmarks and picture-perfect highlights. Finish the day in true Venice style with a private gondola ride through the iconic canals of Venice. Maximize time spent in Italy with a daytrip to Venice from Rome via high-speed train. Cruise down the Grand Canal on a water taxi and utilize priority access tickets to skip the line at St. Mark’s Basilica. Climb up to the church’s terraces for a panoramic view over St. Mark’s Square. Complete the daytrip with a guided walking tour including top attractions such as the Rialto Bridge and the Bridge of Sighs. Experience the history and majesty of Venice with this 3-hour combination tour, including a walking tour of the city plus a guided visit to the Doge's Palace. Let your knowledgeable guide show you the highlights of Venice, from St. Mark's Basilica to the Malibran Theatre. Then head inside the Doge's Palace for a look inside the government offices of the Venetian Republic's reign. Cross the famous Bridge of Sighs from the Doge's Palace. Get a comprehensive tour of Venice while staying on a strict budget with this 2-hour walking excursion. You'll travel with a small group of just 15 people, which means an intimate atmosphere and plenty of time to ask questions. You'll hit all the most famous Venice landmarks in a short amount of time; this tour is perfect for first-time visitors or those on a tight schedule. See the most important attractions in Venice with this half-day walking tour of St. Mark's Basilica, the Doge's Palace and the neighborhood between St. Mark's and the Rialto Bridge. Walk the busy streets from St. Mark's to the Rialto area to learn more about these lively neighborhoods. Walk past the queues with skip-the-line access for a guided tour of St. Mark's Basilica and the Doge's Palace. Learn more about Venetian history at these two famous sights. Many of Venice’s most important and intriguing landmarks are clustered around the city’s vibrant heart at St. Mark's Square. Explore this treasure trove of history on a walking tour that takes you through the winding sidestreets surrounding the famous piazza. Take a break from your guidebook and hear the stories behind Marco Polo’s house, the Malibran Theater, and many others on a leisurely stroll that's great for first-time visitors. See the Venice sights that you want to see with this fully customized private tour, for a group of up to 10 people. Just choose a duration that suits your schedule, then head out with a private guide to discover the city. Perhaps take a tour that gives you the history behind the famous sights of St. Mark's Square such as the Doge's Palace, or maybe focus on the tucked-away treasures of Venice such as the Fontego dei Tedeschi building near the Rialto Bridge. It's the perfect way to explore Venice at your own pace. Explore Venice’s lesser-known artistic and architectural treasures on this 2-hour private walking tour. Your local guide will lead you through a labyrinth of narrow backstreets to discover fascinating churches, squares and other landmarks that lie off the beaten path. Learn the history of these sites and admire their stunning artistic elements while you enjoy the personalized experience of a private tour. Skip the long lines at the Doge’s Palace and explore the historic heart of Venice on a 3-hour tour with a local guide. Walk through the neighborhoods of Saint Mark’s and Castello, where you’ll find a series of historic landmarks, and get a guided introduction to the magnificent Doge’s Palace. This 3-hour Venice tour features headsets so you won’t miss a word of the guide’s stories, and includes skip-the-line tickets at the Doge’s Palace. This 2.5-hour walking tour is tailored to families who want to discover Venice's highlights, hear as much as possible about the history of the city and have fun at the same time! This small-group tour is the perfect opportunity to explore the main attractions of such a wonderful city with an expert, local guide! On your itinerary, you will find famous places like Rialto Bridge, Campo San Bartolomeo, Marco Polo’s house and St. Mark's Square. With our kid-friendly guide, your children can become interested in the Venetian culture and, of course, they will have fun!